Fall is beautiful. Just exquisite. There are crimson trees just outside the front door that are the stuff of Robert Frost. I’ve been trying to take pictures of these trees for three days. I can’t. It started Monday afternoon. On a walk through the parking lot, I was struck by their beauty. I came inside to pull out my camera, and my friend Brooke stopped me. “Would you like to go pick pomegranates with me?” She asked. There is also a pomegranate field on the property, and while having spent quite a bit of time here, I had never picked pomegranates. Pomegranate picking is a rite of passage for living on this property. How could I leave here and never have picked them? Besides, they would look picturesque as a decoration for our Thanksgiving table anyway. “Sure,” I said. The light was fading, so we rushed to grab grocery bags, shoes and scissors (you need those to pick pomgranates, by the way) and headed out to the orchard. It was just out of pomegranate season, and most of the remaining fruits had rotted and fallen off. But we searched through the trees, finding the last few here or there. All the way, I had this weird sense. It was a familiar feeling, and one I had trained myself to heed. It was a sense of poetry afoot. I knew if I tuned in, I would stumble across beauty, poetry, and above all, writer’s material. I was grativating around hippie ideas of simple living, farming, and beauty of nature. But nothing was really sticking. I decided to ask Brooke for input. “So, what sort of life insight can we gain from our experience in the pomegranate field?” I asked her. Brooke loves to be deep, and enjoys when I invite her into such discussion. She thought for a moment. “Hmmm,” she said. “How about how God is always pruning us?” She answered. I nodded and we kept thinking and filling our bags with the mediocre leftovers on the trees. “That’s good,” I said. These rows were all picked over, so we went deeper into the orchard. And suddenly, jackpot. Big splotches of juicy, red pomegranates. We cheered as we delved into the clusters with our scissors, careful of the thorns. “Ooh, I like,” I answered. But somehow it still wasn’t the blinding poetic insight I was feeling in my heart. There was something else. What was it? It was getting dark, so we went home, shelled the pomegranates, and then drank apple cider and played a silly board game that made us all laugh. Life is good. The next day it rained. It doesn’t really do that in Northern California. This is confusing to me coming from south Texas. The rain lives in the very air we breathe, and comes and goes just as naturally. In the summer, it catches the subtropical sun, and filters its punishing waves into a miserable sauna with the heat bearing down with searing incision. Every 5-10 years the whole city goes underwater. The newscasters battle for ratings by standing in what looks like the middle of a lake and then shouting, “I’m standing in the center of this major freeway. You can see the sign up here…” Every newscaster in Houston lives for this moment. This is life as we know it. So for a rainy day to be an event is quite the anomaly. But such is the custom. The rain was the event of the day, and it was also freezing. I love cold rainy days. I burrowed deep inside my sweater, and then said with glee, “I’m so excited! It’s winter.” The room silenced and everyone stared at me. Brooke is from Kansas City by way of Boston and chimed in her agreement. “Yeah, fall,” she said. I shifted my eyes, and my lips rose sheepishly. “This is as winter as Texas ever gets,” I admitted. “Wow,” Caitlin stared me down. “You can get through a Houston winter with a good, solid hoodie,” I explained. She and Brooke started talking about the latest in snow boot fashion. I looked out the window at the dreary drizzle and floated into the kitchen singing, “It’s wintry,” as I made hot tea. The next morning, I woke up late. The lazy, cozy pace of a Thanksgiving Wednesday….I stretched in my covers and then padded down the hall to make my obligatory coffee. (I think I may have a coffee problem). I busied about the kitchen pondering my free and open schedule. There was baking tonight, but today….hmmm….then I remembered my fall tree photos. That’s it. Today, I would take the photos, and then write poetry about them. I made coffee and breakfast, which seemed to be laden with mishaps. The coffeemaker wouldn’t work, so after much consternation, I turned to a pour over. Then my cinnamon rolls, which should have been, pop the can, and throw then in the oven, turned out to be much more complicated than I expected. Then they stuck to the pan and I tried to scrub the goo off and finally resorted to soaking the pan. Finally, after an hour of working in the kitchen, I sat down to breakfast. Then Caitlin was making this gorgeous Thanksgiving centerpiece. It is a thankfulness tree. She gathered branches and arranged them in a vase, and then gathered pretty leaves off the ground. 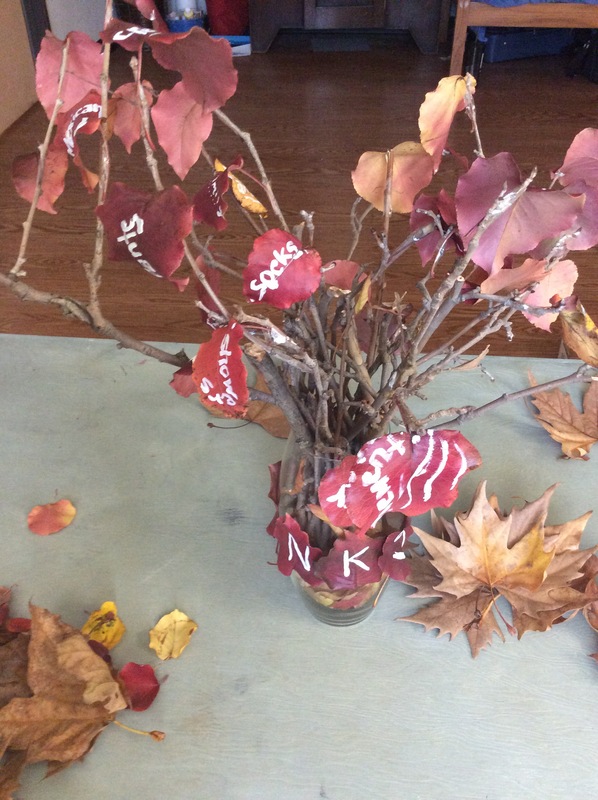 Each of the leaves has been painted with a single word…something we are grateful for….coffee. Waffles. Friends. Arms and legs. Socks. Showers. Creativity. Mexican food. Mountains….everyone in the house has been coming up with ideas and now she is taping the leaves artfully onto the tree branches. It’s a great idea, and super creative and cute. I shared a cinnamon roll with her and chatted with her on her progress. I gave her a few more ideas for leaves. Finally, I finished my breakfast and grabbed my camera. I got outside and let the cool breeze set me in a pensive mood. The rain has stripped many of the trees, and so I search for a full red one. I finally spot one across the street. I think I can catch it with my zoom. I positioned my camera, and was zoning in on the shot, and then it went black. The battery was dead. I went back inside and charged the battery. It was then I noticed the memory was full anyway. I groaned with frustration. So, I opened my laptop to upload the photos, and found my computer was dead. I couldn’t find the computer cord for a while, and then finally saw it buried in a bag. I plugged in the computer, uploaded the photos, and then deleted them off the camera. Okay. Finally, tree time. I went back outside, wandered around, and get a few good ones and went inside to upload them and write poetry. I was headed for the iPad when my friend Daniel found me in the hall. I’ve known Daniel on and off for about twenty years. He now lives in our building with his pregnant wife and two toddlers. Right now, they are in the “this beautiful mess,” stage of parenting and family life. Today, he was as frazzled as I’d seen him in a while. Three year old Joe climbing all over him. I smiled at Joe. “Sure,” I said. “Thanks,” Daniel exhaled and then he bounded out the door to the two waiting squad cars. So Joe and I chilled and played pool and made monster noises and he is a really great kid. Finally, Daniel came back and I went to my poetry. I sat down at my iPad and silence my mind. Then, I pull out the photos and try to tap into the creative stream. And I had nothing. I had cops. And the clang of pool balls. I have Thanksgiving crafts and pomegranates and cinammon rolls and rainy days and goofy girls late at night. I had life. It’s not a partiuclary insightful song, but at ten years old, the story behind it was some of the best artistic advice I’d ever received. Sometimes, in the quest to write what we think we should, we can miss the material right in front of us. Be true. Be genuine. And let your heart write the piece. And that’s what I learned from my tree photo day. I think that’s much more interning than whatever poetry I may have come up with today.